“Leave Gaza, leave Lebanon, my life for Iran,” chanted a crowd of protesters at Tehran University. “Leave Syria, think of us!” demanded others. Iran does not disclose how much it spends supporting foreign “resistance” organizations and clients such as Bashar al-Assad, yet open-source reports suggest those efforts cost more than $16 billion per year. Tehran’s most expensive foreign commitment is supporting the Assad regime in Syria, which may cost $15 billion per year or more. Syria expert Stephen Heydemann estimated in 2015 that Iran spends $15-20 billion per year supporting Assad. A senior military officer, speaking under Chatham House rules, also believes that $15 billion is the best estimate. Some elements of that support, such as publicly announced lines of credit, have a specific value: Iran extended a $1 billion line of credit to Syria in 2017, on top of the $5.6 billion it provided previously. The greatest cost, but also the hardest to estimate, is the deployment of troops to protect Assad, including thousands of its Revolutionary Guard and roughly 20,000 Shiite militiamen from across the region. This does not include the cost of oil and weapons. Iran also bankrolls Iraqi security forces, including extreme pro-Iranian militia. This may have cost as much as $1 billion per year since 2014, according to an estimate that a senior Iranian cleric gave the Washington Post. The destruction of the Islamic State caliphate will presumably reduce the need for Iranian support. This would likely mean that Iraqi proxies will return to their pre-Islamic State totals: an estimated $150 million per year. Lebanese Hezbollah is another client who taxes Iran’s resources. 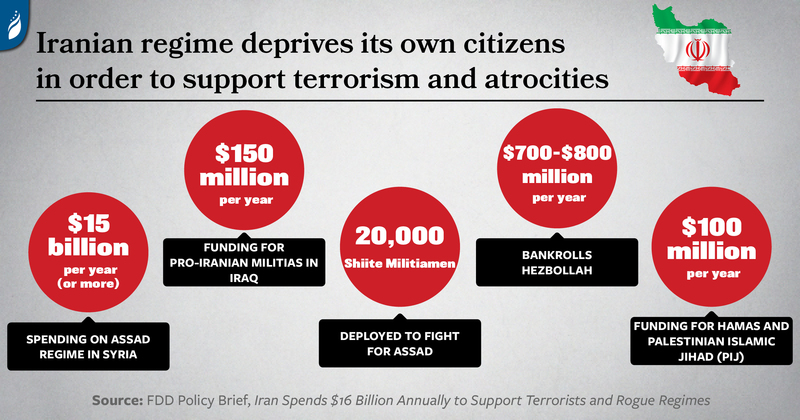 FDD recently published a comprehensive assessment of Iran’s annual support, which is believed to be $700-$800 million. This echoes the assessment of Israel’s top general, Chief of Staff Gadi Eizenkot, who also estimated the figure at $800 million. Eizenkot also reported that Iran spends a combined $100 million per year supporting Hamas and Palestinian Islamic Jihad (PIJ) in Gaza. This figure may represent a substantial decrease from earlier years, when diplomatic sources told Reuters that support for Hamas alone was $250 million per annum. Iran also supports the Houthi rebels in Yemen. In 2015, Secretary of State John Kerry said Iran dispatched multiple planeloads of assistance to the Houthis each week. This year, the U.S. confirmed that Iranian support includes ballistic missiles. The value of such support may be anywhere from several million dollars per years to tens of millions. Since there is so little transparency in Tehran, it is difficult to know the extent to which these costs are reflected in official budget figures. The official Islamic Revolutionary Guard Corps (IRGC) budget is $8.2 billion, yet it likely receives several billion more, in addition to revenues from both its licit and illicit business enterprises. It is unknown what portion of IRGC funding the extraterritorial force known as the Quds Force receives. In addition, other organizations, such as entities controlled by Supreme Leader Ali Khamenei, may fund Hezbollah and other terrorist organizations from their own accounts. All of this is a heavy burden for a country whose economy is one-fiftieth the size of the U.S economy and which continues to struggle with much higher levels of unemployment and inflation. The people of Iran have every reason to be outraged. David Adesnik is the director of research at the Foundation for Defense of Democracies. Follow David on Twitter @adesnik.